Claudia Orlandi married Guillermo Gonzalez, of Asturias Spain in 2014. Guillermo and Claudia spend time now both in Spain and in Vermont. 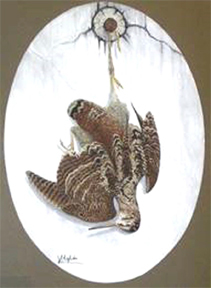 Guillermo Gonzalez Suarez is a very well-known wildlife artist who resides in Asturias, Spain. 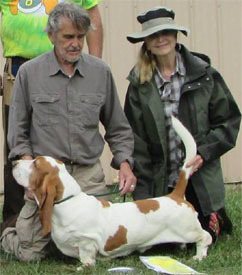 He is a member of the Basset Hound Club of America. Guillermo is also a founding member of the National Spanish Hound Club (Club de Sabueso Espanol) He is also an FCI approved judge of working and conformation hounds. Guillermo has owned Basset Hounds for more than fifty years and still regularly hunts European hare with his pack, the majority of which go back to American Bloodlines. 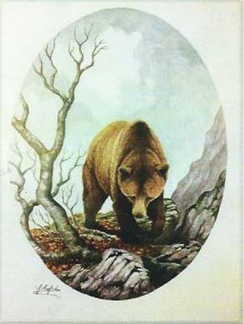 He recently provided the artwork for the current Basset Hound Club of America Illustrated Standard. Pictured above, left & right, beautiful examples of Guillermo's artwork. 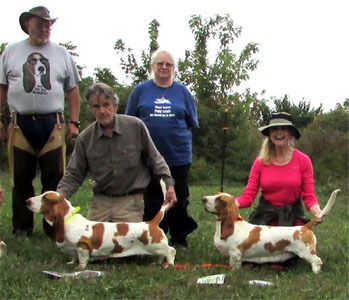 Claudia and Guillermo maintain a Basset Hound hunting pack in Spain. They both spend several months each year hunting with their hounds in Spain, a number of which came directly from our Topsfield Bassets. Claudia and Guillermo will continue to live both in Spain and in Vermont. While here at home in the United States, they both evaluate the Bassets for both show and field work. The breeding program will continue in Vermont, with a goal to continue to breed excellent examples of our breed, and with the additional goal to be able to have them perform as they were bred to do in the field.